One of our team makes two runs a day for a Caramel Macchiato at the corner Starbucks. This one’s for you, Christina. There are numerous types of espresso drinks, from Affogato (espresso served over ice cream) to Vanilla Latte (3:1 steamed milk and espresso with vanilla-flavored syrup). “Macchiato” means marked or stained in Italian (in France, it’s called Cafe Noisette). In Italy, Caffe Macchiato is made in an espresso cup, from steamed milk which is “marked” by the addition of espresso. The espresso, poured into the center of the foam, sinks down and leaves a brown spot on top. In Italy, it’s a mid-morning drink’ many Italians add a bit of sugar. 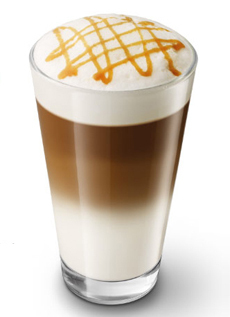 The chief difference between a Macchiato and a Latte is that the Macchiato has aesthetically pleasing layers of color. With a Latte, the espresso and milk are completely integrated (see photos at right). You can make your own at home in five minutes and double the recipe if you like. But try the single size first in case you want to adjust the proportions. You can buy the syrups or make your own (recipes below). 1. WARM an empty cup (we microwave it for 10 seconds) and add 1 tablespoon of vanilla syrup. Froth the milk and add it, along with the foam, to the cup. 2. Pour in the espresso. Drizzle the caramel sauce to garnish, and serve. 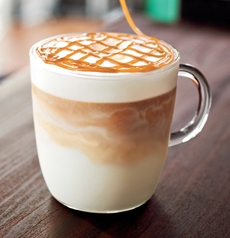 Top: A homemade Caramel Macchiato (photo courtesy Tassimo). Center: A Caramel Macchiato from Starbucks. 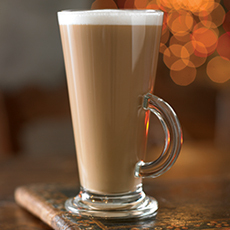 Bottom: A latte from Costa Coffee. 1. COMBINE the water, sugars and salt in a heavy saucepan, add granulated sugar. Cook over medium-high heat until the sugar is completely dissolved, stirring slowly until the syrup reaches full a boil. 2. REDUCE the syrup for 5 minutes over a simmer. Remove from the heat, let cool and stir in the vanilla extract. We store the syrup in a squeeze bottle in the fridge. 2. WHISK in the butter and fully incorporate it into the sugar. Quickly whisk in the cream (bubbles and foam are natural). 3. STIR in the vanilla and salt. Let cool and transfer to a squeeze bottle (or other container). CHECK OUT THE HISTORY & TYPES OF ESPRESSO IN OUR ESPRESSO GLOSSARY.